To help you and others interpret the detailed information presented in a report, Report Painter enables you to summarize numeric information using column and row totals, grand totals, and subtotals. These summary lines may be used to clarify or highlight information in numeric or matrix reports. Column totaling produces a final row on the report, which contains the totals for each column of numbers, or a selected column field. Note: Column totals are only available for columns containing numeric values. Row totaling produces a new column containing the sum of all numbers in each row. Click the Options button on the Output Format toolbar. The Report Options dialog box opens at the Output tab. In the Totals box, click Column totals from the drop-down list to display a total for every column on the report. Click No totals to hide the display of column totals. 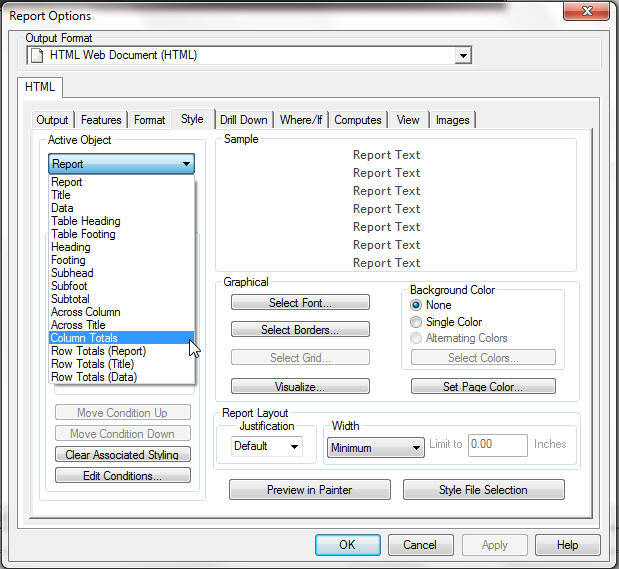 From Report Painter, select the field in the report that you are applying the total to. Click Output from the Report menu. Click Column totals from the Apply to current columns in report drop-drown list. The column total appears in Report Painter, indicated by the word TOTAL, as shown in the following image. 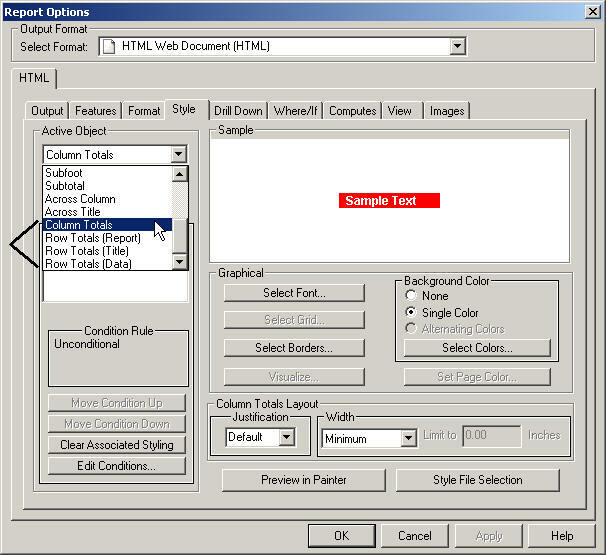 Right-click anywhere on the column total and click Options, as shown in the following image. Note: You may change the title for the column total by selecting Title. The Properties for Column Total dialog box opens at the Styling tab. Click the General tab of the Properties for Column Total dialog box. Select the check box next to the numeric value field(s) to be included in the column total, as shown in the following image. Note: Apply totals to all columns is selected by default. Click OK to close the Properties for Column Totals dialog box. The column total appears for the selected field(s). In the Totals box, click Show Row Totals to display a total for every row on the report. Deselect Show Row Totals to hide the display of row totals. You may style column totals and row totals from the Report Options dialog box. After adding the column/row totals to your report, select Styling from the Report menu. Select the column/row total from the active object drop-down list. Note: The column/row totals appear as Column Totals, Row Totals (Report), Row Totals (Title), and Row Totals (Data), in the active object drop-down list, as shown in the following image. Tip: Column Totals may also be styled through the Column Total Properties dialog box. For more information, see Properties for Column Total Style Tab. Apply any styling to the selected column or row total active object and click Apply. The following image is an example of a report with column/row total styling applied. Frequently, reports contain detailed information that is broken down into subsections for which simple column and row totals do not provide adequate summaries. In these instances, it is more useful to look at subtotals for particular sections and a grand total at the end of the report. Subtotal. Use Subtotal to add up individual values, such as columns of numbers, each time the named sort field changes value. Subtotal shows column totals each time the named sort field changes value. Summarize and Recompute. Summarize and Recompute should be used instead of Subtotal to recalculate calculated values. Summarize recalculates values at every sort break. In contrast, Recompute recalculates only at the specified sort break, like Subtotal. Recap. Recap enables you to use subtotal values in a calculation. The subtotal values are not displayed. Only the result of the calculation is shown on the report. For related information, see Creating Reports With Financial Report Painter in the Creating Financial Reports manual. To further control when subtotals are produced, you can use the When option with any subtotaling command. Subtotal commands are independent of record selection phrases. Select the By sort field in the Report Painter window. Click the Subtotal button on the Columns toolbar. A Subtotal field appears in the Report Painter window indicated by the word *TOTAL. Subtotal displays a total for columns containing numeric values only when a specified sort field changes values. The following report on employee salaries shows the total salary expense of each department, as well as a grand total for all departments. Select the lowest level By sort field in the Report Painter window for which you want a total. Click Subtotal on all outer sort fields from the Insert menu. Subtotal displays a total for columns containing numeric values when a specified sort field, and any preceding (higher level) sort field(s) change values. Select the By subtotal object area in the Subtotal field window. Click Suppress for single lines from the Properties menu. Right-click and select Suppress for single lines from the context menu. Suppress for single lines displays subtotal lines only when the specified sort field contains more than one record. Click Recompute from the Insert menu. A recomputed field appears in the Report Painter window of the report indicated by the word *TOTAL. Recompute displays totals for columns containing numeric values, and recalculates temporary fields containing information, such as ratios using subtotals each time a specified sort field changes values. For details about creating temporary fields in reports, see How to Create a Calculated Value. Click Recompute on all outer sort fields from the Insert menu. You can add to or type over this text. Recomputes display totals for columns containing numeric values and recalculates temporary fields each time a specified sort field or preceding sort fields (higher levels) change values. Click Use Default Text from the Properties menu for the selected object area. Right-click and select Use Default Text from the context menu. The default title is returned to the object area. Right-click a column to which subtotaling has been applied and click Options from the context menu. The Field Properties dialog box opens. In the Columns Subtotals box, deselect the Apply totals to all columns check box. Select a By field in the Report Painter window. Click Recap from the Insert menu. The RECAP dialog box opens. Type a field name in the Field combo box. Type the format directly in the Format box or click the Format button to display the Format dialog box. For details, see Format Dialog Box. Enter a calculation in the window. Note: You can create multiple calculations and display their subtotal values in the report. To enter another calculation in the window, click the New button. Recap computes subtotals based on user-supplied calculations. New values appear each time the specified sort field value changes.